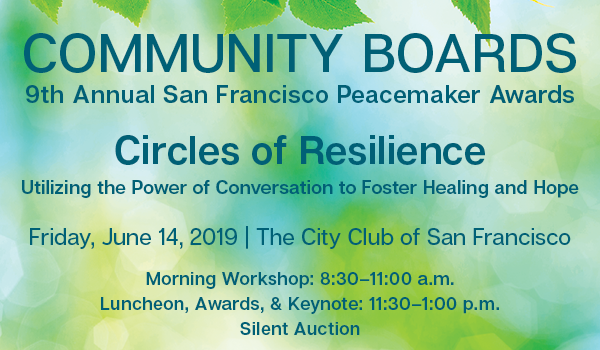 With the San Francisco Peacemaker Awards, Community Boards salutes community builders, anti-violence advocates, and on-the-ground peacemakers. The awards celebrate individuals, organizations, and the next generation of “rising” peacemakers. The event raises crucial funds for Community Boards’ Neighborhood Mediation Program. Renowned restorative justice practitioner and trainer Eric Butler believes in the power of relationship-building as a healing practice. A Hurricane Katrina survivor, Eric relocated to Oakland where he rebuilt his life, facilitating grief circles in response to homicide and extreme violence in area schools. 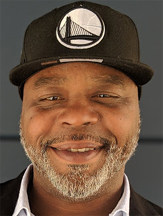 Eric went on to work as a Lead Mediator with Youth Uprising, and from there gained prominence for his impactful school-based work with Restorative Justice for Oakland Youth (RJOY). Eric’s pioneering and transformational approach to conflict work — which hinges on the tremendous power of conversation — has been documented by publications like the New York Times, and most recently, by the award-winning feature film, CIRCLES. Today, Eric continues to practice and advocate for restorative justice in his community, while working as an educator and activist expanding the reach of restorative practices around the globe. Eric teaches that restorative practices are not just tools to be used in schools or in courts: they also offer a way of being that helps communities connect, heal, and make peace and long-lasting change. In collaboration with the Center for Understanding in Conflict, mediator and restorative justice practitioner Eric Butler will facilitate this workshop exploring how culture, race, power, and privilege impact conflict work. When differences arise, the discussion often revolves around the “issue” at hand, ignoring the many forces operating below the surface and from the outside. Each party to a conflict — as well as the conflict professionals themselves — are driven by what is important to them on a deeper level, which is impacted by familial, cultural, and societal forces. Yet, these forces are rarely acknowledged or examined. This experiential workshop will guide participants in looking beneath the surface, to explore and understand the commonalities and differences across cultural lines, and how these commonalities and differences can be the fuel for transformative work. MCLE: This course is approved by the State Bar of California for 2 MCLE credits for the elimination of bias (provider #9323).